Huge congratulations to our Early Stage Researcher Jose Jiménez who successfully defended his PhD thesis on Friday, 30th November 2018. 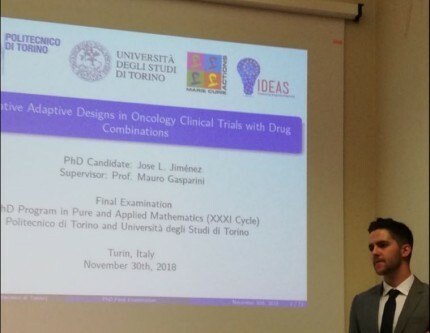 Jose, who is originally from Madrid in Spain, has been awarded his doctorate by the Politecnico di Torino in Turin, Italy where he has been based throughout the IDEAS programme. His research with IDEAS has focussed on innovative designs for combination of existing therapies and the title of his thesis was “Innovative adaptive designs in oncology clinical trials with drug combinations”. Jose has recently started working at Novartis in Switzerland in the Early Development Biostatistics Group and we wish him all the best for the future.